Home /Did an Insider Just Reveal GM’s Bold Plan for the C8 Corvette Manta Ray? Did an Insider Just Reveal GM’s Bold Plan for the C8 Corvette Manta Ray? I’ve been a member of the Corvette Forum for over 15 years now and while I’m not a huge participant in forum conversations, I have learned a few things over the years about those that join the forum. There is something about a person’s first post that is noteworthy. Did you join because you have a question or problem you are trying to solve? Maybe you are an owner or future owner wanting to learn more. You could be a fan of another make/model and you want to troll some Corvette owners? Maybe you know something about the future Corvette and you just need to get it off your chest. That last reason is what we are discussing tonight. A first-time poster on the Corvette Forum named unlimitedPower has posted a thread called “Corvette Manta Ray: GM’s Bold New Plan” and it has really raised a lot of eyebrows from those that have been following the development of the C8 mid-engine Corvette. Could it be that we have another insider following in the steps of those like ZERV that have come and shared some of the Mid-Engine Corvette’s secrets? 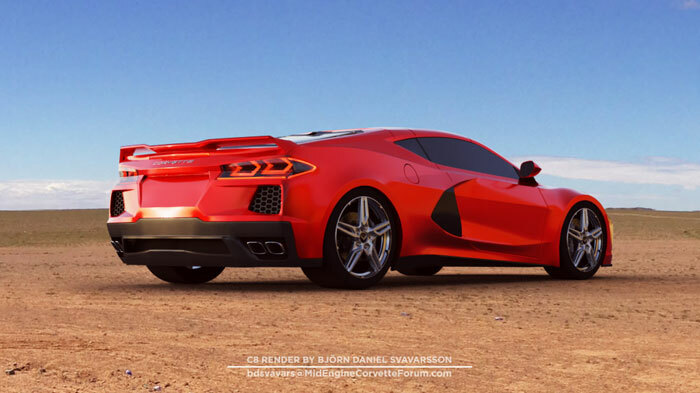 Or is this just a well-written diversion based on the many of the rumors surrounding the next generation Corvette? Like any first-time post on the forum, we have no history to judge any previous comments, but what unlimtedPower has to say does seem very believable. We’ve decided to share the entire thread from unlimtedPower with the disclaimer that “Hey, it’s on the internet so it must be true.” Just joking but you know what I mean. Take it for what it is, and we’ll let history decide if he was correct. I’m close enough to the inside to know the following about GM’s plans for the Corvette. I cannot reveal all I know without jeopardizing my business’s success, so please do not ask me to explain further, I will not answer. If you don’t believe me then that’s fine, I wouldn’t either if I was in your shoes, but I’m compelled to post now so there is less disappointment later when the Eagle has Landed. The C8 Corvettes at Nürburgring are the real thing – the 2020 Corvette Manta Ray. This base Corvette will be powered by an updated LT1 V8 with about 520hp and 485 lb-ft torque. A DCT transaxle is used in all C8 Corvettes, no exceptions. The R&D investment in the DCT is said to be equivalent to that of both the manual and automatic in the C7 – they knew they had one chance to get the DCT right. The interior will be somewhat higher quality than the C7, and GM’s stylists have attempted a more “upscale” design. I have not seen it but those who have say it’s impressive, but still not at Porsche or Ferrari levels, which seems fair given the price. In 2021 GM will revolutionize the Corvette lineup. In addition to the base Corvette two different high-end models will be introduced: Corvette Grand Tour and Corvette Grand Sport. The GT is as luxurious as if Cadillac designed it, because a Cadillac team is in fact responsible for the GT. It’s a true GT and in addition to standard MRC it will deploy a full gamut of NVH countermeasures like acoustic glass, heavy sound deadening, and special wheels/tires, all for a cross country tourer that with a twist of the mode dial will handle any road or even a race track. The GT will be propelled by a version of Cadillac’s 4.2L twin turbo V8 with the turbos moved to the sides, and this engine is said to be the quietest V8 GM has ever developed. Word is that GM benchmarked the Corvette GT’s NVH against German luxury tourers from Mercedes Benz and BMW. Not sports cars, tourers. The Grand Sport moniker will be used for the insane sports version and it will feature additional escalating packages with more and more track orientation. GM found that buyers liked the name “Grand Sport” better than their alphanumeric gibberish “ZO6” so they ran with it. MRC is standard and in later years there will be a track package with DSSV and a higher output engine. What engine, you say? Hold on to your butts because the GS will be powered by a beastly 5.5L twin turbo V8 that is said to be frighteningly powerful and in private track sessions has dominated both “the Germans and Italians.” That’s just the first year GS, not the track-oriented version. My description isn’t hyperbole – those who have driven the GS tell me that it is literally frightening to floor it. GM even had a team of lawyers in to advise on the legal perils of selling such a potent vehicle for street use. How the Corvette is sold will change as radically as the engine mounting position. Any GM dealer will be able to sell the Corvette brand, but on the flip side, it will be far more difficult for dealers to qualify to sell Corvettes. You won’t have to worry about Joey the Chevy Cruze expert wrenching on your Corvette since dealers will require a minimum count of certified Corvette techs and only those techs will be permitted to work on Corvettes. Since “Corvette” will be a brand unto itself it implies more than just the GT and GS sub-models, doesn’t it? Make of this what you will. Interestingly, a mid engine Corvette makes space for the 7th gen Camaro to slip into the C7’s current segment in 2021, at current Camaro prices. The 2021 Camaro will be as revolutionary as the C8 but that’s for another forum at another time. So there you have it, GM’s bold and brash sports car strategy. These will be the last of GM’s gasoline powered sports cars, a bright nuclear flash before the onset of an EV future. I’m familiar with one of the upcoming EV sports cars as well. Suffice to say, performance gearheads have absolutely nothing to worry about because every one of the sports cars (and sports CUVs) in development at GM are poised to vastly exceed expectations. So what’s your thoughts on this post by unlimtedPower? Let us know in the comments below. Should more come from him, we’ll let you know!